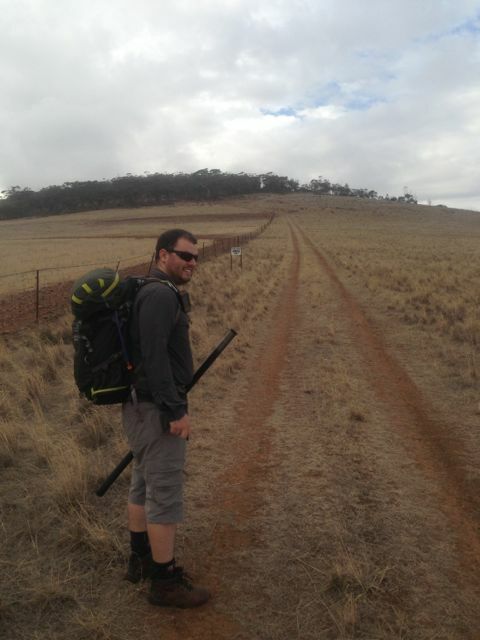 I activated Lagoon Hill on the 20th April, 2013, after I had been to Mount Horrocks summit. Lagoon Hill is 689 metres ASL and is worth 4 points. Lagoon Hill is located about 138 kms north of Adelaide, and about 30 kms north east of the town of Saddleworth. 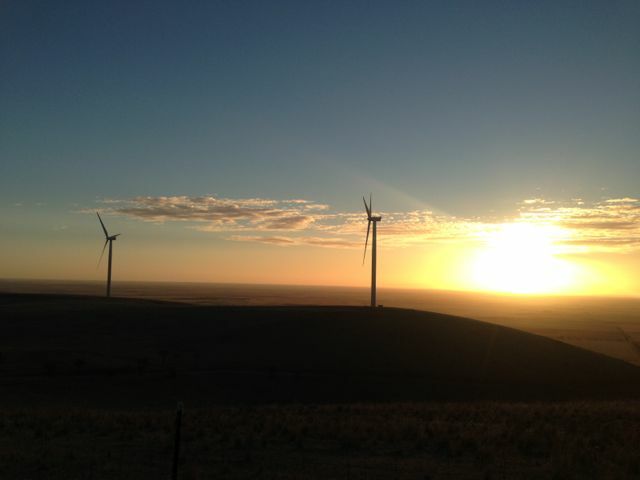 It is located close to the Apoinga Lagoon (was completely dry) and Energy Australia’s Waterloo wind farm installation. The summit is located on private property. Access is via Mollers Gap Road. Travel east on Mollers Gap Road over Apoinga Road, and take the first dirt track on your left. Go to the end of the track and you will come to a cockies gate on your right. Go through the gate and drive through the paddock. You will reach a fenceline where the scrub starts. I parked my car here and then walked to the north slightly and then up the hill. The climb up here is NOT easy. There is NO track leading to the summit. It is bush bashing through the scrub, which is made hard by the fact that the hill is steep and very rocky. 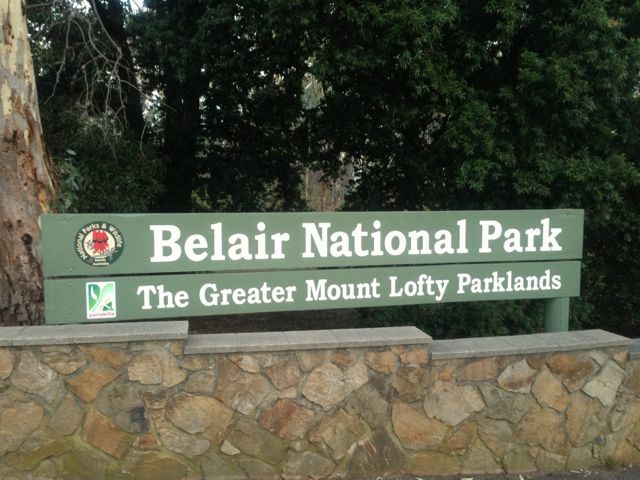 It took me about one hour to get to the top and it was hard yaka ! Ended up with a few cuts & scratches. However once you reach the top, you are rewarded with magnificent views. The view from the top is absolutely spectacular. There is a trig point at the top but it is not easy to find as it is surrounded by thick scrub. There are plenty of operating spots as the mountain is covered in large rocks and small trees and scrub, so there are plenty of options for securing a squid pole or antenna. I found a comfy spot and set up the gear. 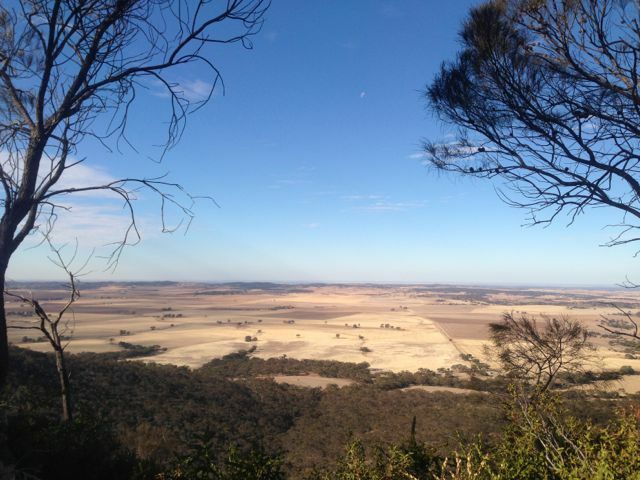 As I sat admiring the view and chatting on the radio, a few Wedge Tailed eagles were soaring above the cliff face. I don’t think they were eyeing me off ! ? I had a total of 20 QSO’s on 40m & 20m. This included a few DX contacts into Europe & the UK on 20m, who were receiving my QRP signal quite well. Unfortunately I ran out of time and I knew I had a hard climb down, and definitely didn’t want to do it in partial darkness. Oh well ! An interesting QSO for me that afternoon was with Nev, VK5WG, who is getting on in years now. This was originally his father’s call sign. I remember often hearing VK5WG when I was a short wave listener in my teenage years (some 35 years ago). Stations worked were:- VK3MRG/p; Robby VK5VRD/qrp (5 watts); Peter VK3ZPF; Tony VK3CAT; Ernie VK3DET; Ian VK1DI; Andrew VK1NAM; Glen VK3YY; Al VK1RX; Nev VK5WG; Richard VK3TXD/qrp (10 watts); Daniel VK5DF; Rhett VK3GHZ; Andrew VK2UH; Bernard VK3FABA; Doug VK3FDRE; Ian VK5CZ/m; Darren VK3FDJT; Francisco EA7ISH; and GB2VEF. A really enjoyable sunny afternoon and a great view that I won’t forget. 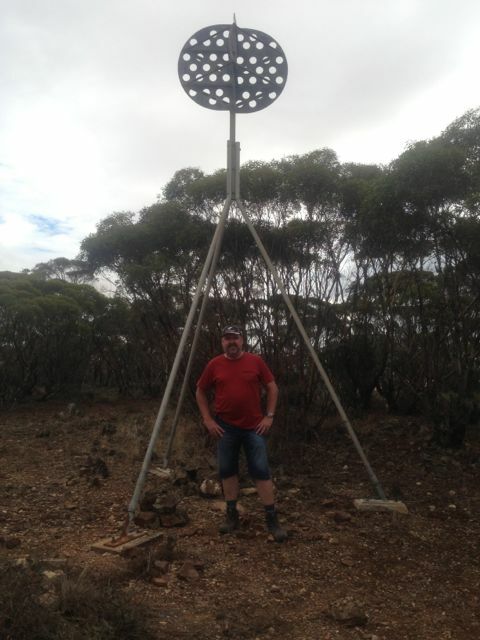 On Saturday the 20th April, 2013, I activated Mount Horrocks summit, VK5/SE-012 in the mid north of S.A.
Mount Horrocks is 610 metres ASL and is worth 2 points. It is located about 132 kms north of Adelaide, and about 27 kms south of Clare, in the Clare Valley in the mid north of South Australia. The Clare Valley is one of Australia’s oldest wine regions and is best known for Riesling wines. The summit is located on private property owned by Mr. Jock GOSS, Mobile. 0428 439 072. Jock is very friendly and only asks that he be contacted first prior to entering his property, and gates are shut behind you as he has sheep grazing on the property. To get to Jock’s property, turn down Queltala Road in the town of Watervale’s main street, and then left into Springvale Road. If you are like me, it’s hard to drive through this great wine country and not stop off for a sip. Travel along Springvale Road for about 2.6 kms heading north, and then turn right into the vineyard before the sharp left bend. There is a small red firetrack sign on the gate. Follow that track right up to the top of the vineyard, and then through an old iron gate. 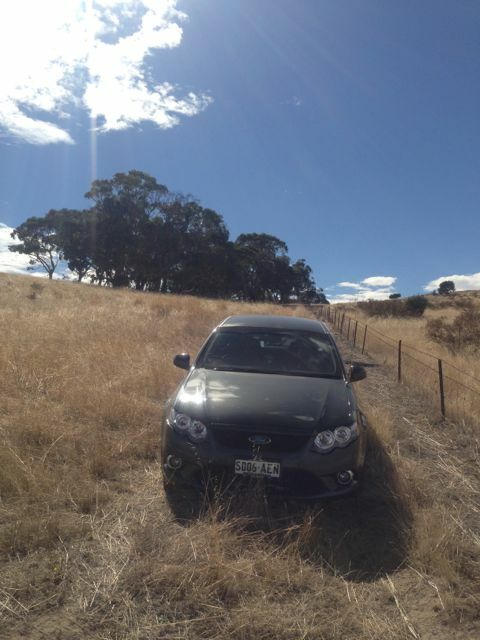 After a bit of bushbashing in your car, then travel under some trees to another gate which will be on your right. Go through the gate and follow that track to the top along the ridge. Just follow the red Fire track signs. There are some spectacular views of Watervale & Leasingham at this point. Then go left through the iron gate which is right at the top. It is about a 1 km walk from that point to the summit. The walk is very easy and is a slow incline, and follows a dirt track. 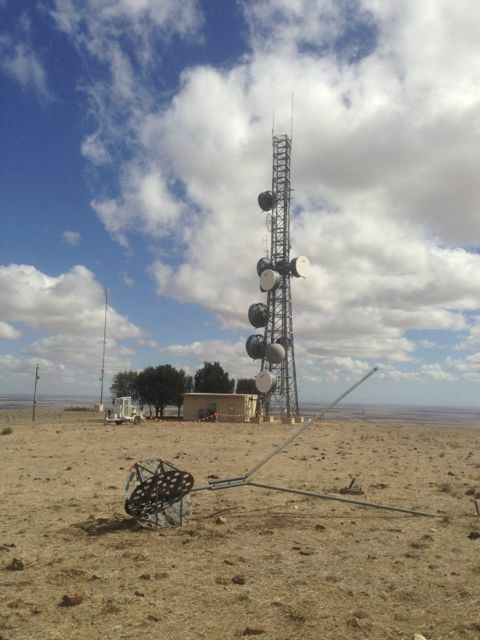 There are 2 radio communications towers at the summit, providing radio & broadband coverage. 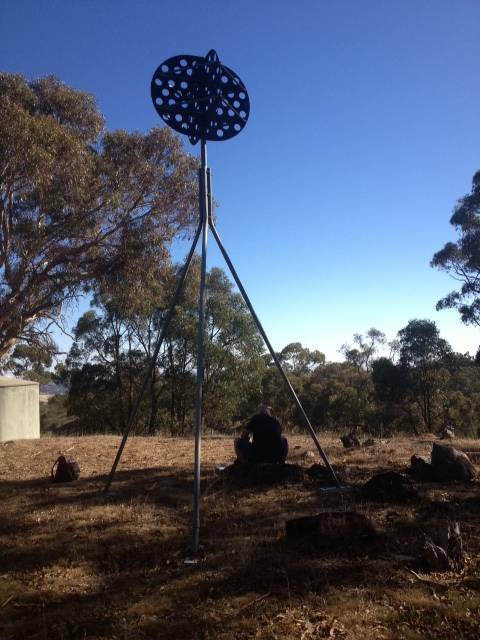 I initially set up close to the towers using what appears to be the base of the old trig point to support my squid pole (this consists of 3 blue poles). But I was really disapointed when I turned on the FT-817nd and had an S8-9 noise floor. So I pulled down the gear and moved further north and set up again a few hundred metres away. Fortunately the noise floor dropped, but it was still S3-4. I used some large rocks to prop up the 7m squid pole and also to sit on. It was fairly comfortable, and not too hot, and view was terrific. There were a few gum trees on the top of the summit, not to far away from my operating spot, should it get too hot. 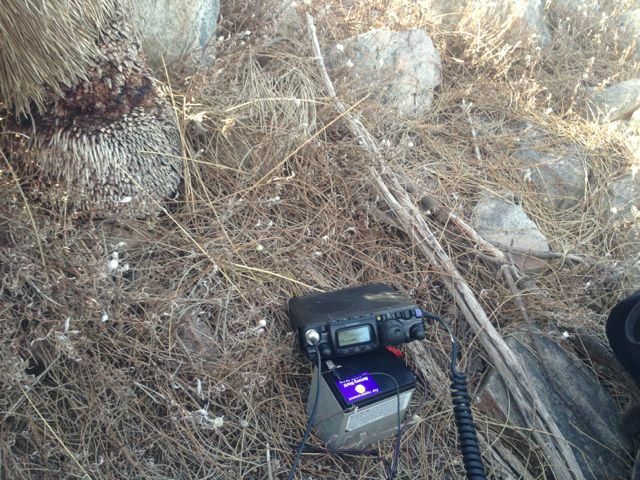 I made a total of 9 QSO’s, including a Summit to Summit (S2S) with Al VK1RX/p. This was only my 3rd S2S, so it was great to make contact with Al, who was a very good 5/5 from the ACT (and 5/5 back from Al). 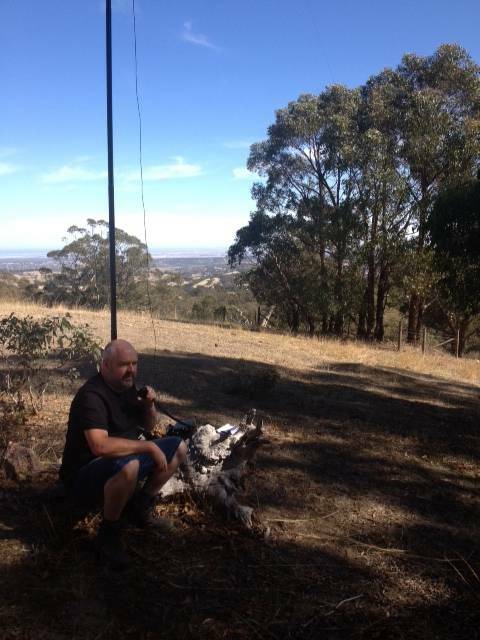 Stations worked were:-Al VK1RX/p (SOTA VK1/ AC-034 Mt Majura); Glen VK3YY; Andrew VK1NAM; Bernard VK3FABA; Matt VK1MA; Peter VK3ACJ; Peter VK3ZPF; Dale VK5DC; and Ian VK1DI. It was a fairly quiet morning for me despite conditions appearing to be quite good. Many of the normal ‘chaser’s weren’t around the place. 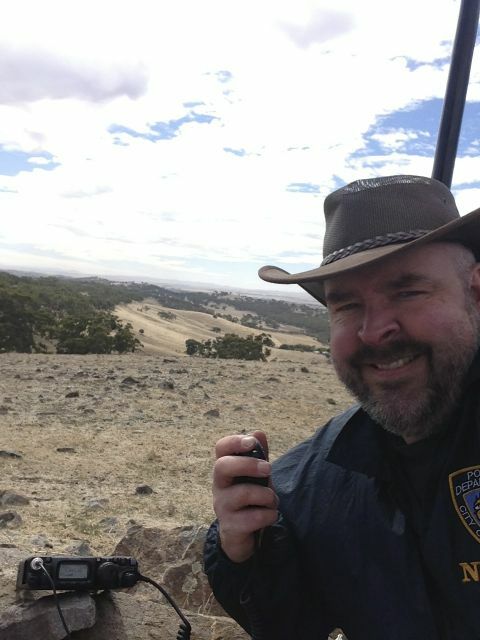 But I was just happy to get the 4 qualifying QSO’s and the S2S with Al was a real bonus for me. 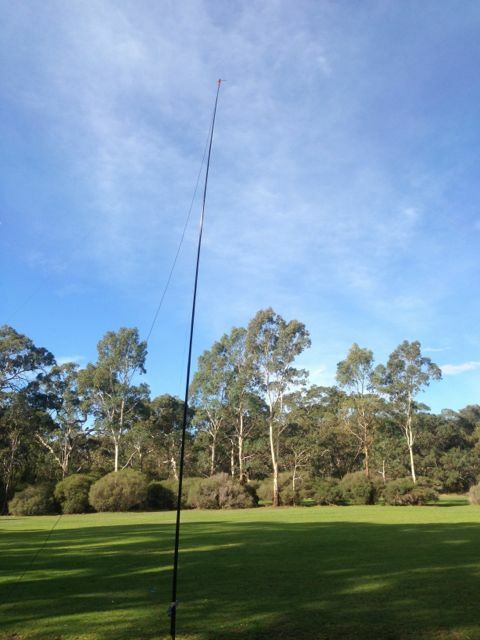 On the 14th April, 2013, I activated Illawarra Hill, VK5/SE-014, with Andy, VK5AKH. Illawarra Hill is 434 metres ASL and is worth 1 point. 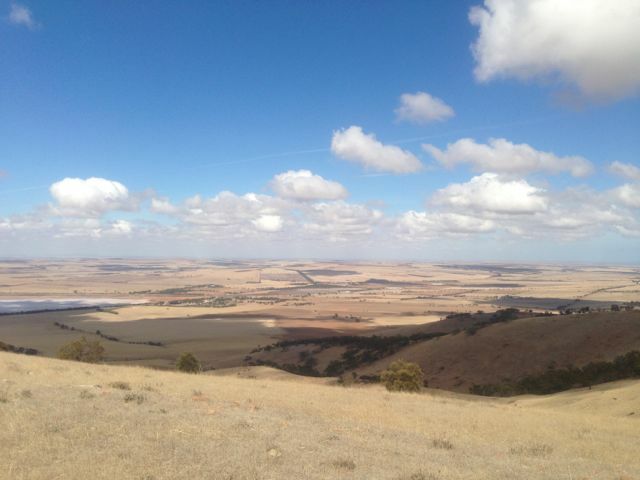 It is situated about 156 kms north of Adelaide, and about 11 kms west of Snowtown. 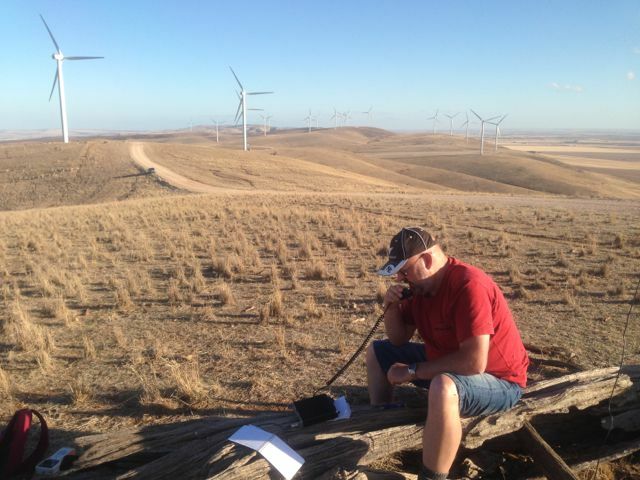 The summit is located on private property and is amongst the Trust Power wind farm. The owner of the land is Mr. Levi HANSEN, Mobile. 0418 857 021. Access is via Shadwells Gap Road. This summit was extremely windy (as you would expect) and we received quite a few comments about the wind noise. There are 2 major towers here as well, but these did not cause us any interference. There are no trees or shrubs up the top of this hill. So the wind roars in off the ocean from the west ! There was a convenient old log which we sat on and operated from, dodging the ants and spiders that had made the log their home. 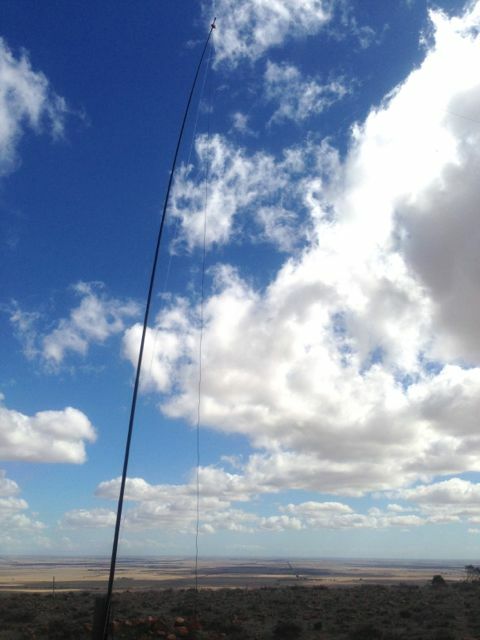 We also used it to support the 7m squid pole. Andy & I used my Yaesu FT-817nd and his Elecraft KX3, 5 watts, and the 40m/20m linked dipole. I made a total of 24 QSO’s, including some DX contacts into Europe. 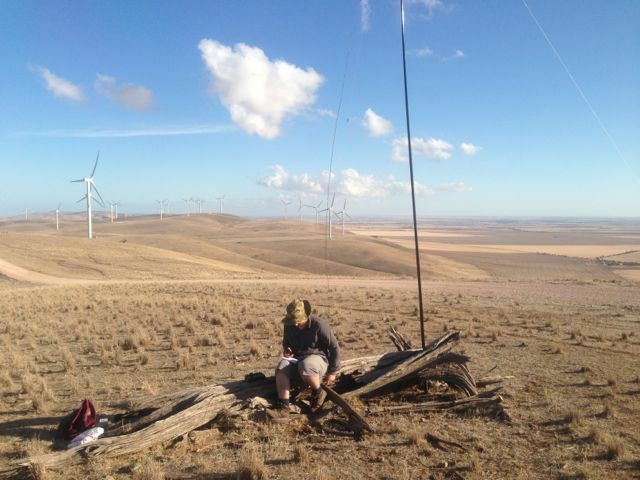 Stations worked were:- Will VK5AHV; Tony VK3CAT; Dale VK5FSCK; Steve VK5ST; Ernie VK3DET; Rick VK3KAN; Kevin VK3KAB; Bernard VK3FABA; John VK5AJQ; Craig VK3CRG; Rhett VK3GHZ; Bill VK5MBD; VK3ANL; Al VK1RX; Shaun VK5FAKV; Wayne VK7NET; Peter VK3PF/m; Allen VK3HRA; Brenton VK2MEV; Glen VK3YY; Marjan S51RU; Michael DJ5AV; Luis EA3JE; & Paul EA5/GM0OPK. Again, a very enjoyable day spent with Andy climbing hills and playing on the radio. 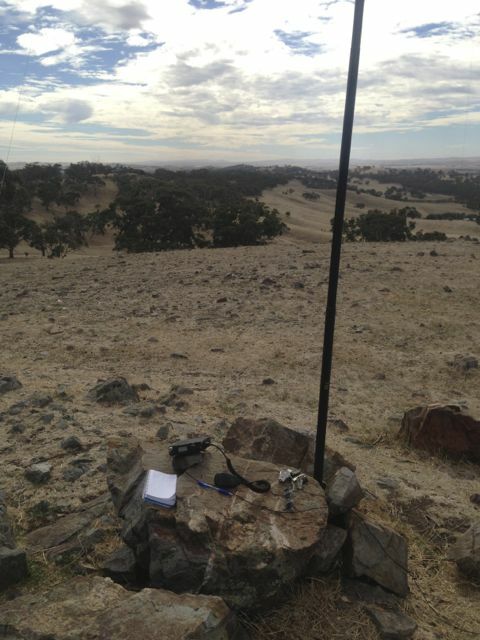 I activated Bumbunga Hill with Andy, VK5AKH, on Sunday, the 14th April, 2013. Bumbunga Hill is 413 metres ASL and is worth 1 point. 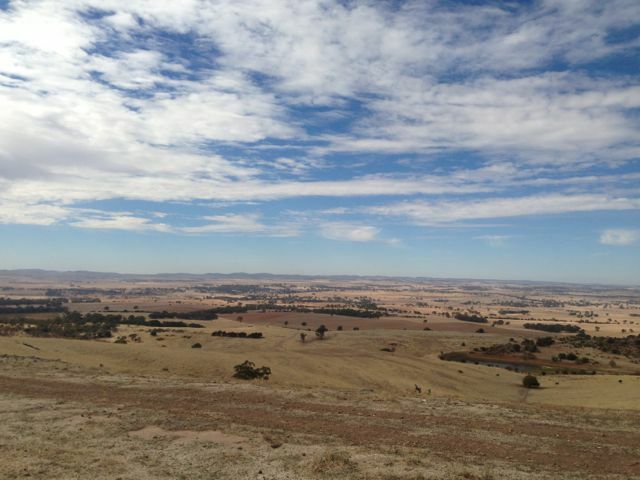 Bumbunga Hill is situated about 139 kms north of Adelaide, and about 10 kms north west of the town of Lochiel. It is located on private property owned by Mr. John GREEN, Ph. 8826 2135 (H) or Mobile 0427 101 482. John is a really friendly guy and loves a chat. His only issue is that people shut gates behind them. Access is via Landslide Road, through John’s property to the top of the hill. You need to travel through a few gates to get there, and some of the diret tracks are very rough and rocky with a lot of washaways. There was trig point at the summit, but it had seen better days and was lying on its side. 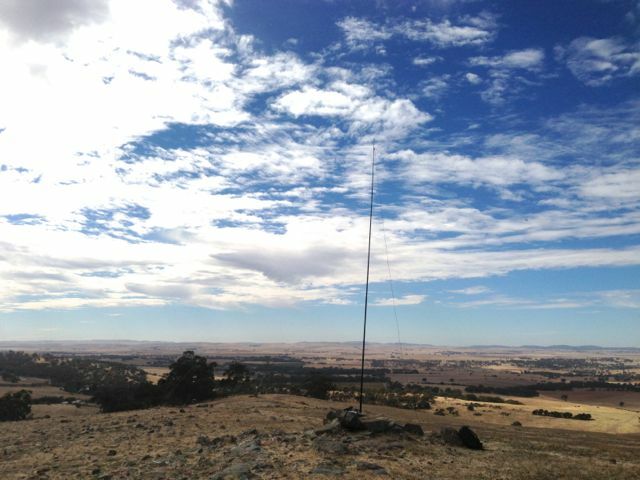 The Lochiel amateur repeater is located at this site, along with a few other towers with microwave repeaters, etc. However these did not cause any interference. There are magnificent views in all directions. It is perched above the town of Lochiel and Bumbunga Lake. The nearby summits of South Hummocks and Illawarra Hill are clearly visible. Fortunately not too many flies up here and it was initially windy, but when the sun came out from behind the clouds it was hot. There are no trees up here for shade, so bring the sunscreen. Andy and I used my Yaesu FT-817nd and his Elecraft KX3, 5 watts, and my BandHopper 40m/20m linked dipole. Strapped the 7m squid pole to one of the fence posts. I had 18 QSO’s on 40m and 20m. Stations worked were:- Ernie VK3DET; Peter VK5KX; Arnie VK5NEX; Scott VK5FSKS; VK3BML/p; Mal VK3FMAL; Allen VK3HRA/p; Dale VK5FSCK; Steve VK5ST; Bob VK3BNC/p; Bernard VK3FABA; Wayne VK3VCL/p; John VK5AJQ; Andrew VK3FABE; Tony VK3CAT; VK3KQT/p; Ken VK3ALA; and Brenton VK2MEV. A great time had operating with Andy. 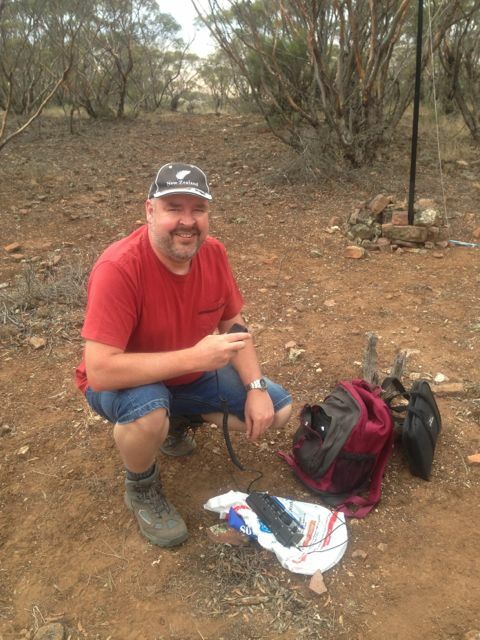 On Sunday, 14th April, 2013, Andy, VK5AKH and I travelled to the mid north of S.A. and activated 3 summits including South Hummocks, VK5/ SE-017. South Hummocks summit is 330 metres ASL, and is worth 1 point. South Hummocks is situated about 127 kms north of Adelaide, and about 30 kms north of Port Wakefield. It is the big hill visible when travelling north towards Port Wakefield along the Pt wakefield Road. The summit is located on private property on the eastern side of the South Hummocks Pump Station Road. The land owner is Mr. Colwyn MILLARD, Mobile 0409 676 605, who kindly left the gate to the paddock open for us. If travelling south on Sth Hummocks Pump Stn Rd, the gate (double farm gate) is about 1.3 kms south of Millards Road. 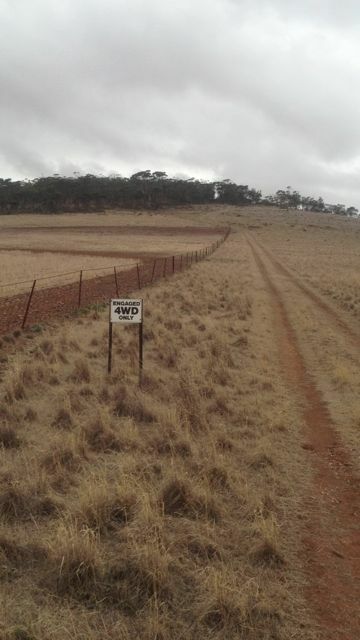 We followed the dirt track running through the paddock up the fenceline to a point where there was a sign saying ‘Engaged 4WD only‘. A new fence was being built at this point which runs north-south. We parked the car here in the paddock and walked up to the summit. It is a fairly gentle climb from this point up the dirt track which becomes very rocky after reaching the scrub on the hill. About 400 m from this point is the trig point. Keep a good look out for the trig point because it is not easy to spot. It is located in thick mallee type scrub on your left, over the fence line. This summit is NOT located where the tower is. The hill which the tower is located on is about 1 km to the south of the actual summit where the trig is located. Andy & I found that the flies and the ants at the summit were amazing, so definitely bring your Aeroguard ! There is a convenient star dropper in the ground which you can use to strap you squid pole to. There are also quite a few large rocks which you can use to prop up a squid pole. The hill is covered in thick mallee type scrub and gums, so there is a bit of shade if you need it. Andy and I used my Yaesu FT-817nd and his Elecraft KX3, 5 watts, and my BandHopper 40m/20m linked dipole. I managed 13 QSO’s on 40m & 20m. Stations I worked were:- Ian VK1DI; Shaun VK5FAKV; Allen VK3HRA; Peter VK5KX; Bernard VK3FABA; Scott VK5FSKS; Ian VK3AXH; Glen VK3YY; Leigh VK5KLT; Tony VK3CAT; Dale VK5FSCK; Ernie VK3DET; & Brenton VK2MEV. It was a real pleasure to operate with Andy. 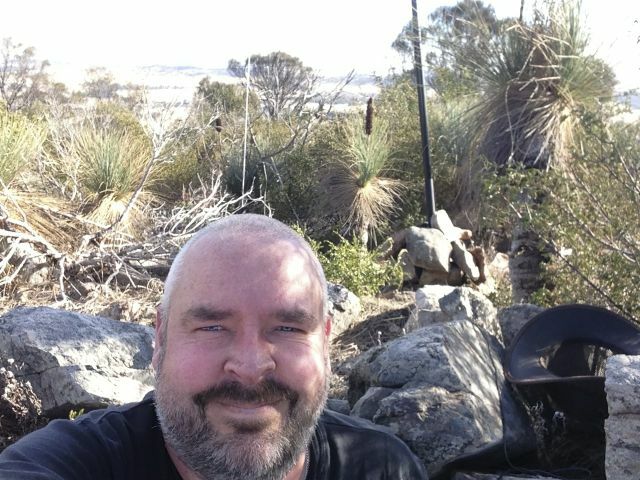 On the 7th April, 2013, I activated the Mount Gawler summit, VK5/ SE-013. Mount Gawler is located about 32 kms north east of Adelaide. 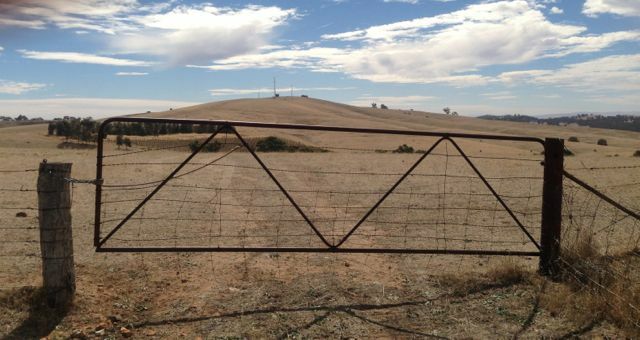 Despite its name it is located about 26 kms south of the township of Gawler. The summit is about 8 kms (by road) west of the town of Kersbrook. 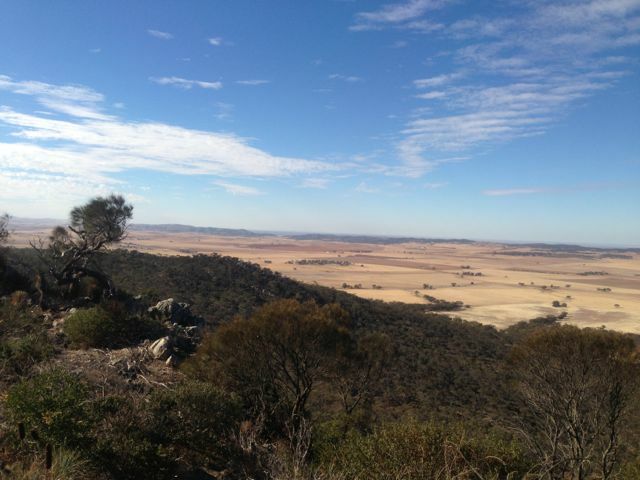 Mount Gawler is 541 metres ASL and is worth 2 points. 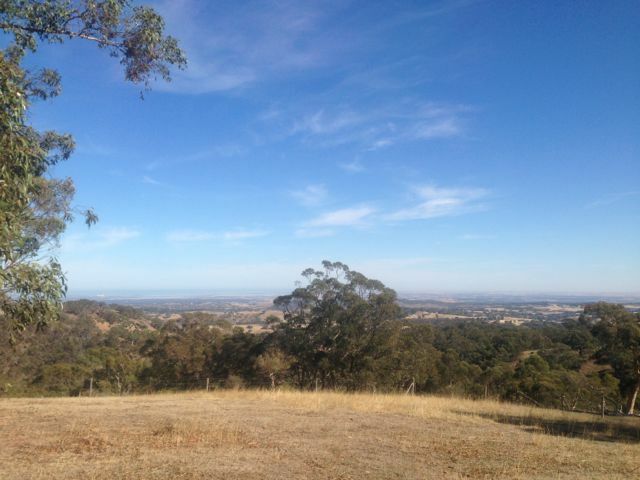 Mount Gawler is very easy to access off the Mount Gawler Road (between Airstrip Road and Richardson Road). The actual trig point is located on private property. I telephoned the owner, Noel, and he kindly allowed me to come onto his land once I explained to him all about SOTA and amateur radio. He is a nice friendly fella. I used my yaesu FT-817nd, 5 watts, and my vertical. I swapped to my BandHopper 40m/20m linked dipole about half way through, and signal reports increased. I managed a total of 17 QSO’s. This included my 1st ever Summit to Summit (S2S) QSO with Peter VK3PF/p. I was really quite excited when Peter gave me a call. 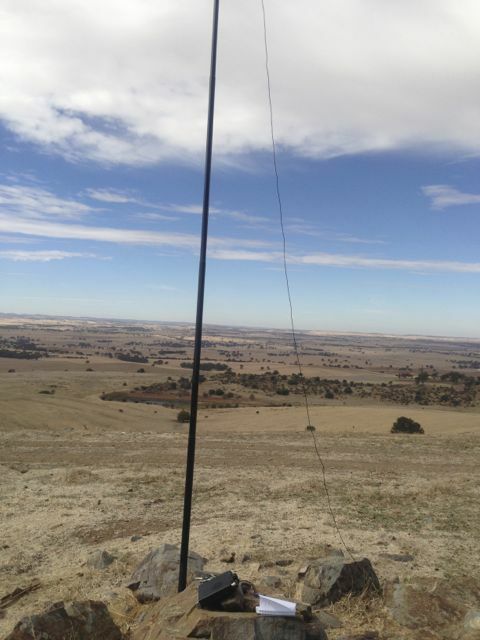 Stations worked were:- Glen VK3YY; Matt VK1MA; & Allen VK3HRA. And then after the UTC rollover:- VK3PF/p (SOTA); Peter VK3ZPF; Shaun VK5FAKV; Frank VK3GFS; Matt VK1MA; Glen VK3YY; Ian VK3TCX; Peter VK3FPSR; Allen VK3HRA; Ron VK3AFW; Tom VK5EE; Andrew VK2UH; Bernard VK3FABA; & Colin VK5FCJM.